In a classroom filled with first graders stood the principal, teachers, and Petaluman Jenny Giacomini, a volunteer with Project Linus. Recently a family, both parents and two young children, had been killed instantly in a needless car accident by a driver who ran a red light. These were the classmates of one of the kids, and the students were trying to come to terms with the fact that their friend was gone, and that a whole family could disappear without warning. Project Linus, a nonprofit group that provides blankets to children suffering from illness or trauma, was on hand to help in its unique way. She said, “This lady is here to give a blanket to each of you, because a blanket makes you feel safe and warm and loved.” The kids were so excited – one boy said, “I don’t have a blanket! 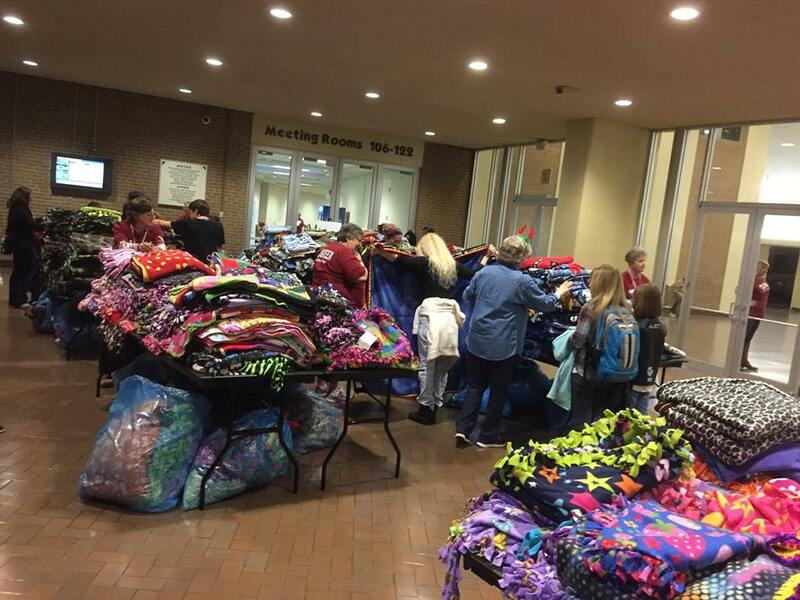 !” As the blankets were handed out, the teachers looking on got tears in their eyes. 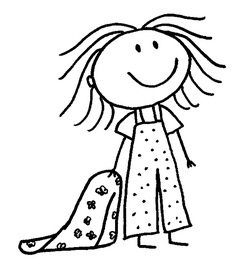 Upon leaving the class, a boy was seen tucking his blanket in around his neck and using it as a cape. 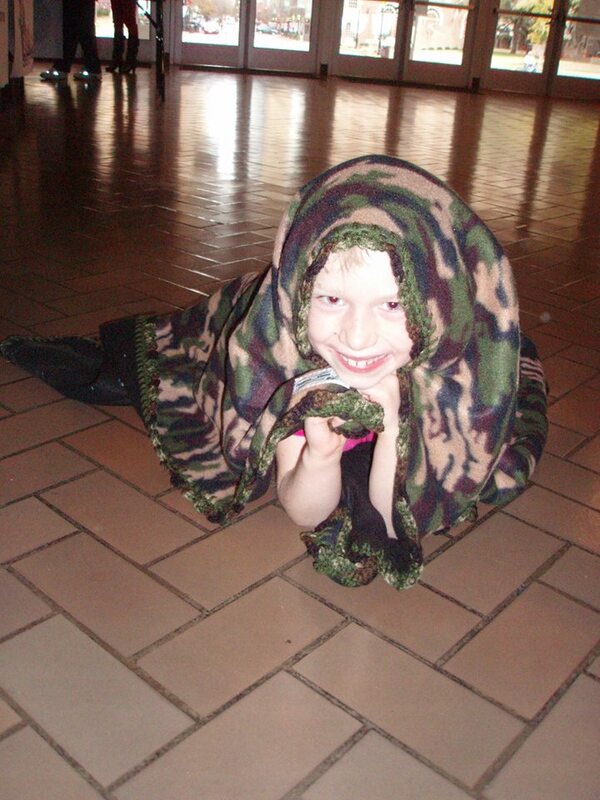 “Good use for a blanket,” someone noted. The principal said that that boy was autistic, and she didn’t think he would accept a blanket, but he did and he was loving it. Bringing blankets to kids in need of comfort has been Jenny Giacomini’s focus for the past decade. She is the coordinator of the local chapter of Project Linus, which is a national nonprofit organization. Her chapter has handed out over 10,000 blankets since she started it in 2004.The majority of her blankets are distributed locally, throughout Sonoma County and into Marin, and occasionally farther afield when the need arises. In the event of a nationwide or worldwide catastrophe, PL headquarters will put out a call for blankets, and each chapter sends what it can; thousands of blankets can be gathered in a matter of days. “I was looking through a woman’s magazine and saw an article on making blankets for Project Linus and thought, ‘I can do that.’ When I went to the PL website, I saw there wasn’t a chapter around here, so I decided to try to start one,” explained Jenny. She went on to say that starting a chapter was completely outside of her comfort zone, but having recently lost her father, she was at a point in her life where she wanted to find something fulfilling and meaningful to do. Those who contribute blankets to Project Linus are dubbed “blanketeers,” and they donate their time and materials to making blankets. 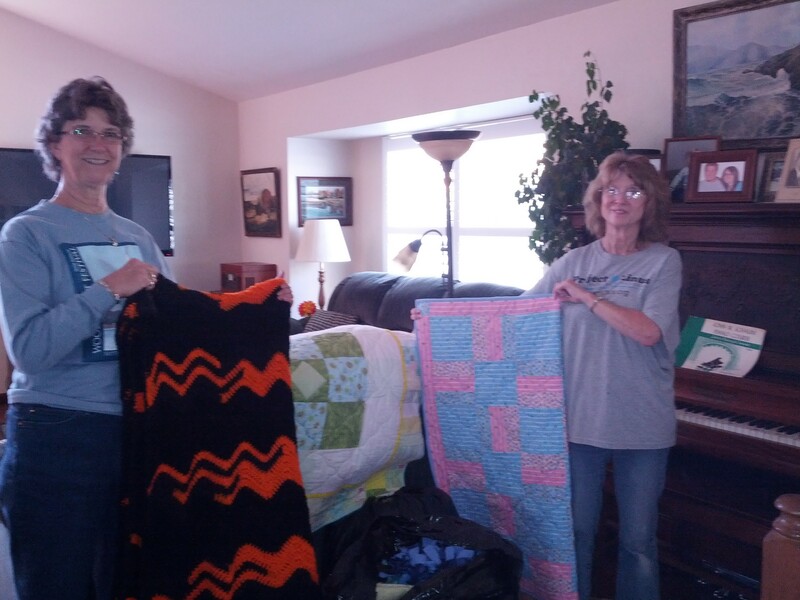 In Jenny’s chapter, members work on their own and drop off finished blankets at various spots around the county. Some members quilt, some knit or crochet, and some make no-sew fleece blankets, which are a popular project for youth groups learning about community service. Members of the local chapter have taken to meeting monthly at Beverly’s in Rohnert Park for blanket show-and-tell and to plan for fundraising events for the chapter, which include an annual holiday craft bazaar selling homemade crafted items and a summer yard sale of craft supplies where members can lighten their stashes and people can feed their creativity. Project Linus is always happy to answer questions for people who would like to make blankets, and would especially like to hear from people who know of places that might like to receive blankets. “Our biggest challenge is making contact with people who know where the need is for our blankets,” said Jenny. When Jenny sees an article in the paper about a family suffering from tragedy, she tries to make contact to get blankets to the children affected. The chapter routinely gives blankets to hospitals, health centers, agencies that work with low-income families, and practices that provide support for children. The Petaluma police department also carries blankets that can be given to children with whom the officers come into contact. Such entities, however, tend to see frequent personnel changes, and when Project Linus loses a contact person, it often loses an outlet for blankets. “I know these people have more important things to do than let us know they need blankets, but it can be disheartening to be unable to make contact to make deliveries,” Jenny explained. She welcomes input from the public about any particular needs for blankets, whether on an ongoing or individual basis. Jenny also welcomes anyone who has any craft-related items they might want to donate to the yard sale this summer. The proceeds benefit the local chapter only and cover such expenses as postage and laundry soap. 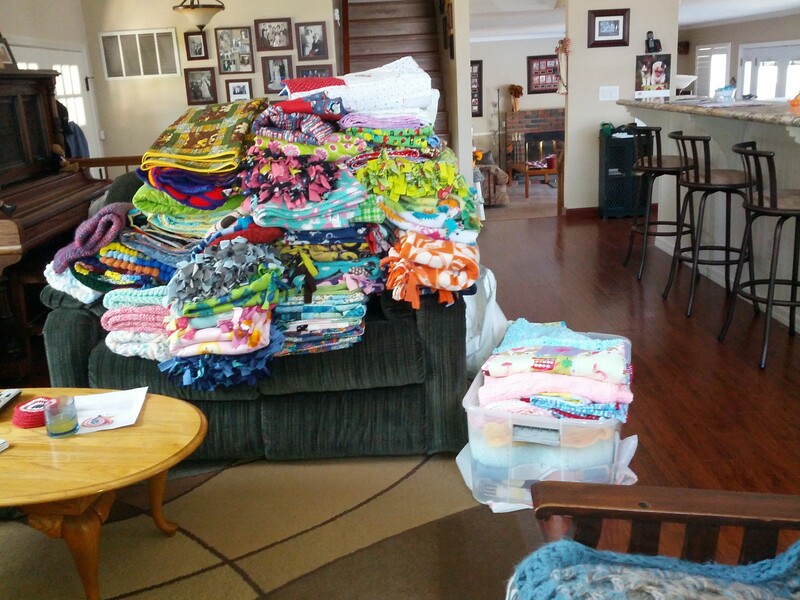 Donations of yarn and fabric are always received enthusiastically by the blanketeers as well. Wow – this is so awesome that you shared about this VERY important non-profit. Ironically, I took the photo of Jenny with my sister, Marie, holding up a couple of blankets. My sis is very involved in the chapter in the Klamath Falls area. She was visiting here and stopped by to get a ton of blankets from Jenny’s chapter then went to Sacramento to get even more blankets which combined with her area were then taken to the kids of Weed, CA right after the fires. So many lost their homes, places of business, and went through a very frightening time. The stories my sister shared of that day distributing blankets to all the children of Weed were so touching! 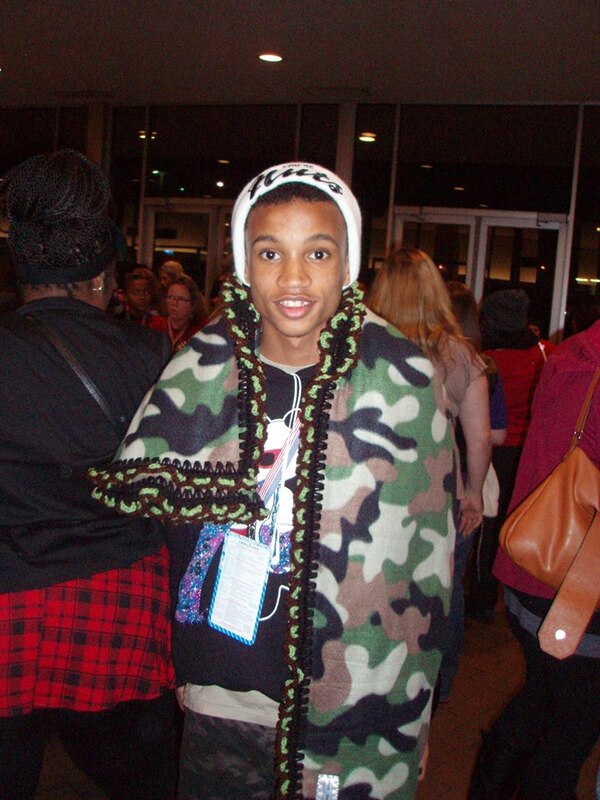 And on a smaller scale they get blankets to kids who go through any challenges. My own son was a recipient of a BEAUTIFUL quilt that someone lovingly made which he received after coming home from the hospital due to his diabetes diagnosis. He treasures it to this day. If anyone can crochet, sew/quilt, or knit and can spare any time they sure could use your help. If you can’t do any of those (that would be me) you can donate money and/or materials. And keep your eyes and ears open for kids who are going through a tough time. A hospitalization, a loss, a parent being deployed, etc. and reach out to your local Project Linus chapter. Wow Anastasia, thank you for the very nice words. P.S. Jenny – I meant “they” meaning PL as an organization overall, but you’ve done great things here locally! Previous Previous post: Did You Know That #Petaluma Had A College?